The International Business Chamber of Cambodia opened a new office yesterday on the 12th floor of the Phnom Penh Tower. IBC Chairman Brett Sciaroni said the move demonstrated a trend of business associations giving more visibility and presence for companies that operate in Cambodia. “This is one more indication of the professionalisation of business associations in Cambodia,” he said. “As the IBC has increased its range of activities and its commitment to the public-private dialogue process in Cambodia, we needed more staff and facilities. Phnom Penh Tower is a leading address in Phnom Penh. We chose this location to show the significance of the IBC as a leading business association and we’re not the only business association that’s located here,” he said. IBC executive committee member John Brinsden said the location reflected what the members deserved. The IBC has more than 80 members, organised by company, and the people who attend are representative of those member companies, including many global brand names. “This is something we’ve been thinking about for a long time: a prestigious office to serve our members. 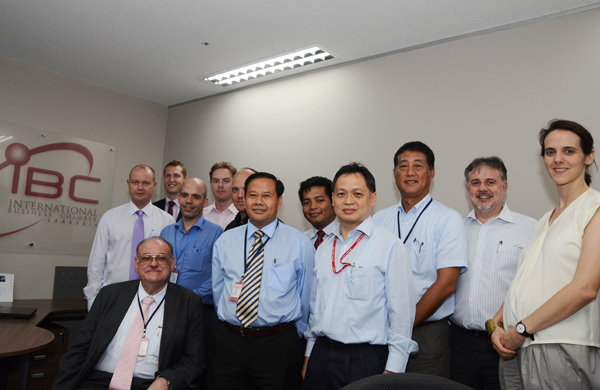 We provide our members and potential investors in Cambodia with a chance to meet in one place. We’re here with an address; we’re in the yellow pages. Visiting foreign investors, people having a look around Cambodia can come and talk to our staff and get some basic information and contacts they can use,” Brinsden said. IBC Vice Chairman In Channy, CEO of ACLEDA Bank, said the new location was a place where members could meet and get information. The IBC’s new executive director, Audrey Tugendhat, who runs the office on a day-to-day basis, said members of the public could visit and receive updates on the IBC social events calendar.